A while ago I mentioned a Kickstarter for printing your own gaming terrain and now an Miguel Zavala is releasing downloadable miniatures files that enable you to print your own D&D monsters. I’d love to play some sort of half-dragon, half ogre, Sorcerer, Fighter. Nobody said it had to be a legal combination. 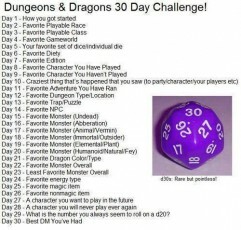 I would love to play a half-dragon though and I miss the old prestige class that was in the D&D 3.5 books, as that had awesome role-playing potential. Is the ten foot pole. I know it’s a bit of a cliché but the pole has plenty of uses and deserves to be part of the humble adventures tool-kit; how could you not marvel at the versatility of this wonder of nature and it’s almost free to own. This ones certainly from the newer 3e version of the game, as the earlier editions of the game never really defined engender types. The Drow. I understand that there may be dark elves in a world but I never see the point of all the specialised magical items that they have that lose their abilities when taken beyond the underdark. As each edition of D&D has appeared, the overall number of monsters has increased and when D&D 3e was released the Open Gaming Licence gave game designers the chance to release bestiaries of their own making the task of trying to pick a favourite monster harder to do. The one creature that does stand out and is my overall favourite is the bizzare Owlbear. An unholy fusion of an owl and a bear which was probably created by an intoxicated wizard. Without a doubt the Red Dragon is my favourite, not just for the fire-breathing but the attitude to go with it. It was a pity I never got to run the old adventure Dragon Mountain as it combines dragons and kobolds in one deadly combination. Is the humble Kobold. Even though the cute little creatures have changed from being dog like to descendants of dragons, I have a soft spot for them. I once created a kobold adversary who used darts as his principal weapon and was capable of doing quite a lot of damage in a short space of time. I think my eyes were opened when I read all about Tucker’s kobolds in Dragon magazine 127. For me you can’t beat the intelligent and meat eating Shambling Mound.